I have carefully chosen what my experience as a business coach tells me are the biggest challenges salon owners and managers face. My advice is tried and tested, researched and specifically targeted to the hair and beauty salon industries. 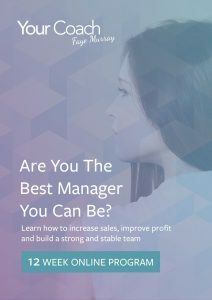 My 12-week online program is designed to highlight the management qualities needed to be successful and lead a motivated team. You will finish the program with hair and beauty specific knowledge, energy and the confidence to be the sort of manager that you aspire to be and over time guide others in the same skills. The program is jam packed with resources that are yours to keep forever and can be accessed and used as often as you need. The program includes 6 management videos designed to grow your salon business and 6 team videos to motivate and train your team. The team videos are 15 to 20 minutes long and are designed for one on one training or can be used for team meetings. As you get to keep these resources forever, you can use these to view and review as often and for as long as you need. Each week the course covers a different topic in-depth, alternating weekly between management sessions and team training sessions. Content is delivered to participants at the start of each week and includes videos, workbooks, action sheets as well as a range of templates, resources, downloads and more. Within the week, participants can review the content at a time that suits. Questions can be submitted at any time by email however if participants would like to discuss their business specifically, they are encouraged to sign up for a private coaching session. Once you sign up, you are directed to complete your transaction via PayPal. Please note that you do not have to have a PayPal account to process the payment, you can just use your credit card to pay. WHAT IF I HAVE SPECIFIC QUESTIONS ABOUT MY BUSINESS? General questions can be emailed directly to Faye at any time throughout the program. If you have specific questions about your business or would like to explore a topic more in depth, it is recommended you sign up for a private coaching session. WHAT IS A PRIVATE COACHING SESSION? As you work though the program you may find that you have some very specific questions that you would like to discuss further. As an additional added value, Faye will arrange a 30 mins phone or Skype session with you to give you the specific assistance you need. The cost of this special private coaching session with Faye Murray is $125 and is available in Australia only. In the first week, I will get you thinking about what you currently do, how successful that is and changes you need to make. 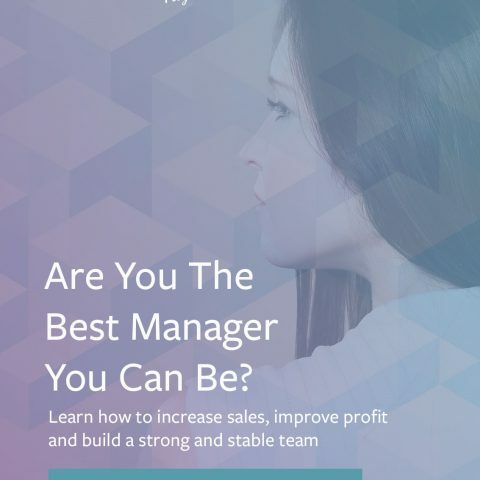 I will give you practical and real ideas that are proven to work that you can immediately implement to make you a better manager and get you the results you need. Week 3: Does Your Communication Get You The Results You Need? So many people think that re-booking is about making the next appointment when the client is leaving the salon. It is so much more. When this service is offered correctly it will build your business faster than any marketing campaign. Week 5: Do You Want Loyal Clients And A Loyal Team? This session, I will show you what you can action so that your team will love working in your salon. Learn how you can get the extra 20% effort to get 20% more in results from your team and how this will retain more clients. I have had great success when working with this subject because I have proven that if you have the right attitude and use the right words you can get great results. I am not going to teach you to “sell”, you will learn to be sincere, consistent and truly believe in what you recommend. Everyone always wants to know how to put incentives and bonuses in place. In this session, I will give you a guide to setting up an exciting incentive program that will be a WIN/WIN for you and your staff. Week 8: Team Subject: What Can You Do To Have A Full Appointment Book? The best way to determine how good you are as a therapist or hairdresser is to look at your appointments. If you are fully booked you are winning clients. If you have gaps, you need to make changes. This session will share with you the key points that will influence a client’s decision to return to you for their next visit. Week 9: Do Your Clients Talk About How Special Your Salon Service Is? Client service is talked about constantly both person to person and especially on social media. You don’t have a choice, you must get this right. Get it wrong and people love to tell others. It does not happen without clear expectations, training and follow up. This subject is the most critical to get right if you want success and covers all the critical service points. There are some key focus points that if you understand will help your day run smoothly, will improve your time efficiency and will increase what you can earn. This session will look at 10 key points that will develop you as a true client winner. Week 11: Is Your Business Supported By Structure Or Are You Just Winging It? Creating systems and structure does take time but without this you will waste hundreds of hours chasing your tail. Most people have no idea where to start and what is needed to be put in place. In this session we will get your list in place and help with templates to get you started. The important thing to get right when you are quoting price to a client is that the dollars must not be the focus point. The value and what the client gets is what will help them make the decision to buy. This session we will work through some great examples of how best to do this.